Now you new handbag can look like Sofia the First. Yes really like Sofia, actually it is a copy of the head of this little princess. And you can zip it open to find a nice purple sating storage room that can hold all kind of purse things. 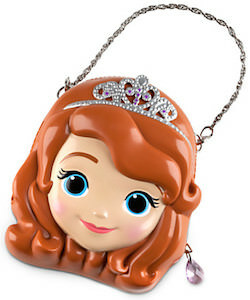 The Sofia the First bag has a removable wrist chain so that you can use this purse the way you like. It’s just fun for adults and kids to have a purse that looks so much like the princess in training Sofia the First. Come and have a look at the inside of this Sofia The First Kids Purse. 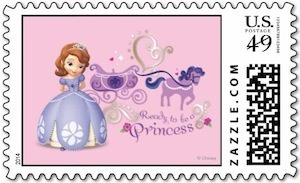 No more boring postage stamps for you as now you can send mail with real princess stamps. This stamp shows Sofia The First with a pink background with a horse and carriage and the text “Ready to be a princess”. You can get this postage stamp of Sofia in different values so that it will perfectly with your needs. And yes this is an official US Postal Service stamp that you can stick on all your mail from postcards to big envelops. Disney princess fans of course want to use these fun stamps that just show the world how important this little princess is. Come and order a set of Disney Sofia The First Postage Stamp. How do you teach you kids about shapes and have fun at the same time? A Sofia the First puzzle will do that. This 12 piece wooden jigsaw puzzle will keep kids busy and they will enjoy themselves to because they are building a princess. 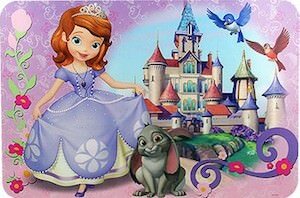 On the puzzle you can see Sofia the First standing in a big room with a book on her head. 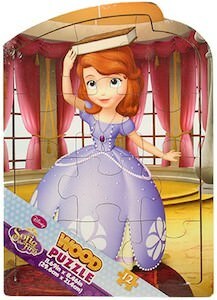 This Sofia the First puzzle is 11.69 x 8.46 inch and is made from wood so no bad plastics. Now is a great time to have a closer look at this Disney Sofia The First Wooden Jigsaw Puzzle. I am sure that Santa would love to see a nice Sofia the First Christmas stocking this year. And now you can have one. This stocking is 18″ and is made from a purple felt material with fun Christmas shapes on it and on the top there is a picture of Sofia the First. Why not enjoy Christmas with you favorite little princess Sofia. And I am sure that it has plenty of room for Santa to put in some nice stocking stuffers. 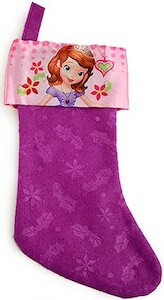 Come check out this Disney Sofia The First Christmas Stocking. Most little girls want to be a Disney Princess. And with this costume they can become Sofia the First. The costume includes and amazing dress just like the one Sofia wears and a princess worthy tiara. Shoes are not included in this costume but did you see these Sofia the First Shoes? A costume like this is great for play and of course Halloween. 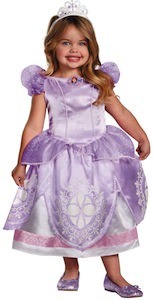 This deluxe Sofia the First costume comes in sizes Medium(3T – 4T) and Large(4 -6). 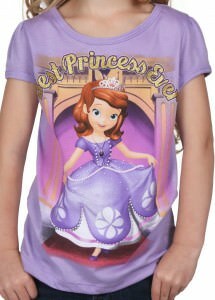 So if you girl wants to be a Disney Princess then now she can be Sofia the First. 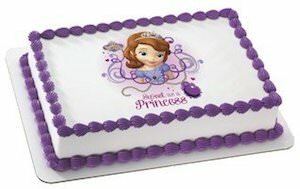 A Sofia the First birthday party of course needs some special items to make it a super party. This cup is one of those things that would look great. The Sofia the First cup is made from plastic and can be easily reused many times and that makes it fun as the kids can use it at the party and then take it home so that they can remember the fun party you had. 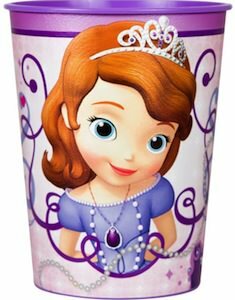 The party cup is 16oz and has a purple color with on that some special princess decorations and of course a picture of Sofia the First. Start arrange you party needs and start thinking about this Sofia the First Party Cup.